Play Drums for Life is a Raleigh, North Carolina-based drum studio owned and operated by Peter Albrecht. Peter specializes in drum lessons, percussion instrument instruction, consulting, and equipment repair for students and schools throughout the Triangle. Private drum lessons including marching percussion, concert percussion, and drum set (beginners through high school, including adults), instrument repairs, clinics and ensemble rehearsal, and performances. Also provides audition preparation for all county, all district, all state, and college music examinations. Students are encouraged to become familiar with the entire percussion instrument family. 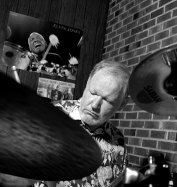 As a private teacher in Raleigh, North Carolina for over 20 years, Peter has taught private lessons to percussion students of all levels, from beginner to adult. He also works with both high school and middle school percussion sections and ensembles. His students currently perform in school music groups, regional orchestras and wind ensembles, as well as church, college, and professional groups.